Almost from the moment Dialed In came storming down the stretch to win the Holy Bull Stakes at Gulfstream Park on Sunday, the buzz began. Overseas, the future book odds on the son of Mineshaft dropped from 40-1 to 12-1 in less than the 1:35.19 it took the dark bay or brown colt (why can’t we just settle on a color?) to complete the one-mile distance of the Grade III feature. “He's very special,” noted trainer Nick Zito after the race. “I've never had a horse do this, go from a maiden special race to jump up and win a race like the Holy Bull. I had a good feeling and confidence in Julien [Leparoux] to let him be in the right place and then get into the mix. I just wanted him to get out clear and settle. I'm not sure what will be next. The idea is just to get him [to the Kentucky Derby]." 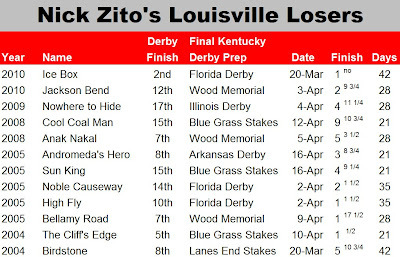 Now, when Zito says the goal is Churchill Downs on the first Saturday in May, rest assured Zito will be at Churchill Downs on the first Saturday in May… come hell or high water. Since 2004, the 62-year-old conditioner has saddled 12 Derby starters, including last year’s second-place finisher Ice Box. 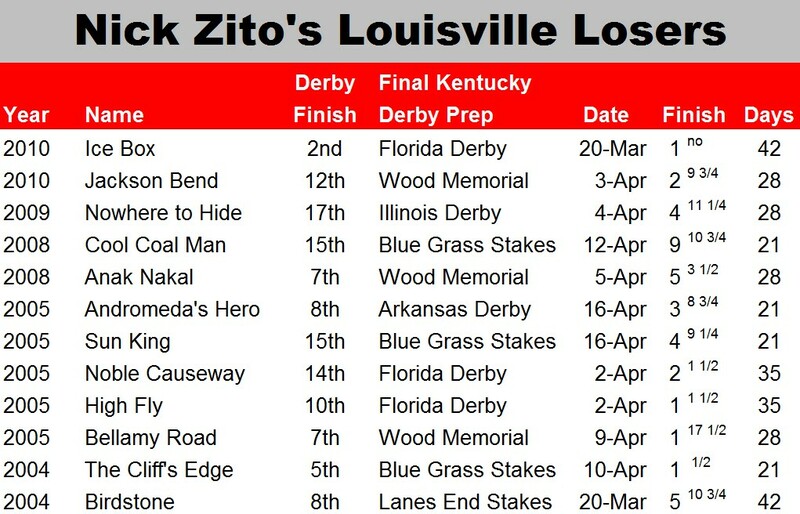 And it doesn’t seem to matter whether the horses that accompany him to Kentucky are in form or not, as witnessed by such dubious Zito Derby entries as Nowhere to Hide (2009), Cool Coal Mine (2008) and Anak Nakal (2008) — all of whom were badly beaten in their final prep. As for Dialed In, yes, he’s talented, but is he Kentucky Derby talented? Personally, I don’t think so. Look, I know that both Big Brown and Barbaro were light on seasoning when they triumphed in Louisville, but inexperience has not exactly been a hallmark of past Derby champs. It’s also worth remembering that Barbaro annexed his first two starts by a combined 16 ½ lengths, while Big Brown captured his first two races by a sum of 24 lengths. Dialed In has managed to stay perfect by just two lengths… yet he’s getting hyped more than a Disney Channel special, which is saying something. Can Dialed In win the Kentucky Derby? Sure, but if you’re taking less than 50-1 on that proposition, I think you’ve got the wrong number. And speaking of “buzz” horses, while Dialed In was setting tongues to wagging in Florida, Machen was doing the same in Louisiana. After breaking his maiden by 5 ½ lengths in a swift time on Jan. 2, Machen was bet down to 1-9 in his route debut four weeks later and, despite lagging behind a :50-3/5 opening half, the Neil Howard trainee drew off to yet another impressive victory. Regardless of what the future holds, Machen’s immediate prospects look bright. Howard has hinted at the Risen Star as a potential next start for his sophomore star and the son of Distorted Humor certainly fits the profile of other Bayou-based Derby contenders (Pyro comes immediately to mind). As regular readers know, I generally don’t waste a lot of column space with advertising-type stuff, but I feel I would be remiss if I didn’t mention that, for the entire month of February, players can get Brisnet Ultimate Past Performances for free. I switched over to Brisnet PPs earlier this year and I’ve been extremely satisfied with the results — so much so, that I gush about the product all the time. Typically, after some initial confusion (I learned it’s best to stick to the phrase “past performances” rather than abbreviate when talking to racing newbies), most handicappers share my enthusiasm — or at least pretend to. Judge for yourself by signing up for a free account at http://www.brisnet.com/cgi-bin/trk_report.cgi?uwc. COMMENTS: Although 6-WISHFUL TOMCAT is the 2-5 morning line favorite, I think he’s vulnerable in this spot. Yes, I know the Richard Dutrow trainee has a huge class edge against these — but that is precisely why I think the six-year-old ridgling may not be at his best on Friday. To begin with, Wishful Tomcat is running for a tag for the first time in his career after failing (as the 3-5 favorite) against the likes of Ruffino ($401K in lifetime earnings) and Icabad Crane ($450K) in the Tinchen's Prince Stakes. What’s worse, he hasn’t raced in over two months and his work tab has been somewhat spotty as well. On the plus side, Dutrow is extremely proficient with class droppers. Still, at 2-5, I need to see more and will try to beat the big favorite in the show pool, where I think Wishful Tomcat will be a massive underlay and, thanks to Net Pool Pricing, we may find some value. BET(S): SHOW on 3 and SHOW on 5 if Wishful Tomcat controls 75% or more of the (show) pool. Note: Play is restricted to any horse(s) that meet my fair odds requirements (when listed). Multiple qualifying contenders will be bet separately, however, multiple bets will be adjusted to equal a single wager, with the payoffs averaged. For example a winning WIN/PLACE wager paying $6.20 on top and $4.30 underneath would count as a single bet paying $5.25 (the average of $6.20 and $4.30).